The above rates are for 2 people. An additional charge of $3.00 per person over the age of 6 and $5.00 per adult over 19. Our campground includes full hookup oceanfront sites with power, water, sewer, and cable TV, as well as oceanfront tent sites. Wireless internet is also available in the campground. For the convenience of all guests, a heated washroom with coin operated showers and laundry facilities are available. Also available at the office is a complete line of fishing tackle as well as rental gear, rental boats, kayaks, fishing licenses, bait, snacks, souvenirs, and information. Camping Rules: To ensure your stay with us is enjoyable and to lessen the strain on our water and sewer services, stay within our operational limits and fit within our limited parking, the following rules have been developed in conjunction with our campers and staff. Pets must be kept on a leash at all times on the property. Dispose of garbage and recycling in bin located next to entrance. Speed limit is 5 km/hr in the campground. Alcohol is allowed only in your site and is not permitted in public locations. All campers must register at the office upon arrival, with 1 camping vehicle per site. Please be considerate of adjacent campers. Visitors to your campsite are limited to 3 visitors at anyone time , limited to a 4 hour visit between the hours of 9am to 10pm. 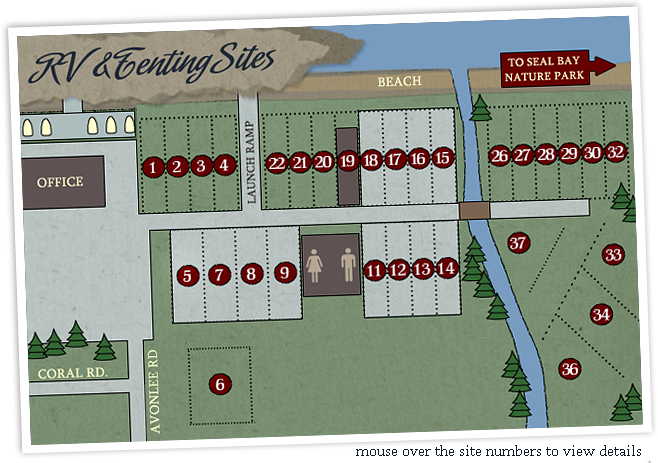 All visitors must check in at the office and park in parking lot or on the road and are subject to all campground rules . Non registers campers visiting registered are requested to leave their pets at home. Campfires are allowed in designated fire pits, subject to Fire Bans and must be attended at all times. We are open year round so plan to visit us during the winter if you are coming skiing or just visiting the area. Please enquire for our low season rates as well as specials we offer every spring and fall. MONTHLY - Oct. 1/18 - April 30, 2019 All full service sites $675 plus g.s.t. per month which includes hydro, cable tv, water, sewer and wifi. All monthly renters require a completed and approved application form. Pets are welcome in the campground but must be kept on leash while on the campground.